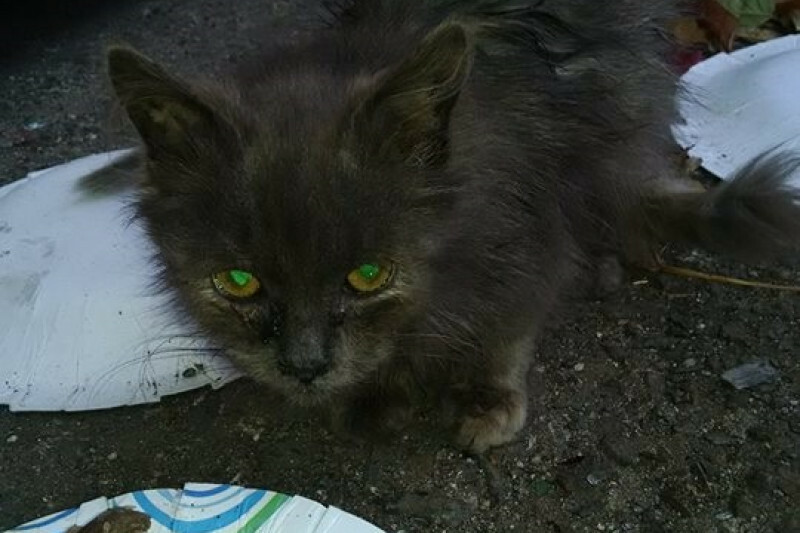 Metro Cat Rescue needs your help so that we can continue to help cats living in the streets. We are DROWNING in bills for food, medical costs and supplies. Please DO donate so that Metro Cat Rescue can be there for community kittens and cats. 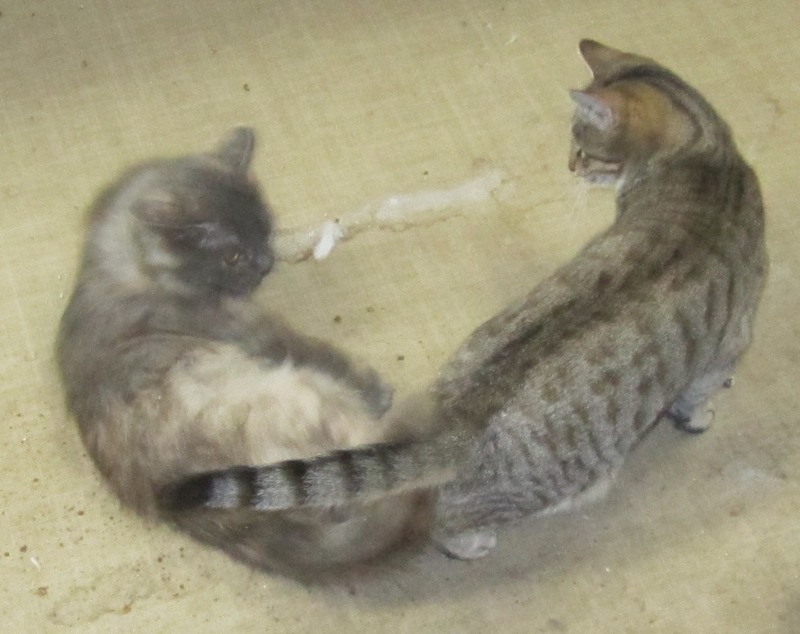 Metro Cat Rescue coordinates the volunteer care of many outdoor cats in a number of colonies. We're working hard to bring some inside to socialize and to place in good homes. This takes lots of time, space and money. 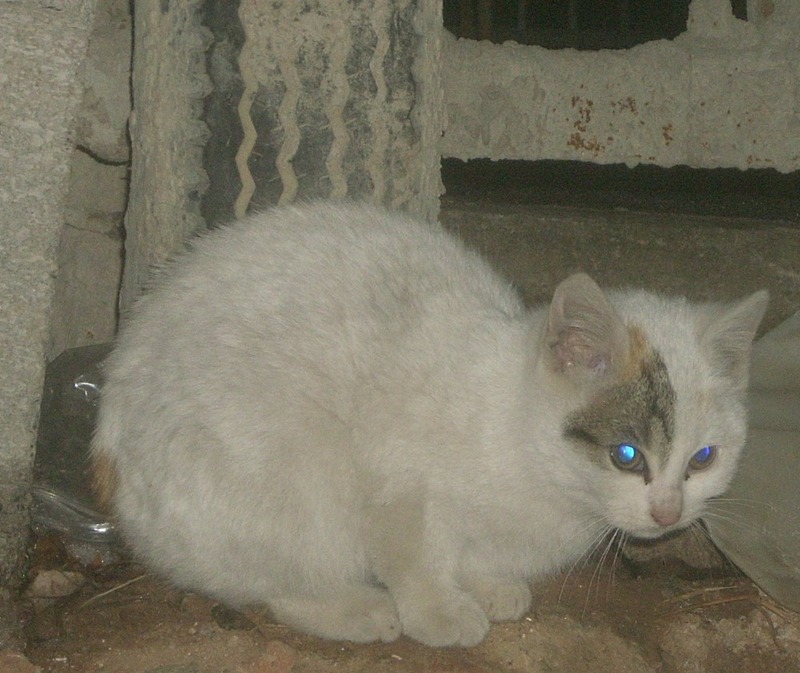 Many dozens of cats in a number of colonies receive food and clean water every day. Shelters have been constructed for as many as we can. A daily census is taken. If a cat goes missing, a search is conducted to be able to provide medical attention if needed. Beautiful Venus DeCoco, the cat in the picture above, is one of our success stories. Venus DeCoco was a kitten living in a cared for colony of outdoor cats in an inner city parking lot. As the chill of autumn set in once and for all, the tyke's health began to fail. Venus was a feral cat when she arrived. Indeed, when first placed in her temporary quarters, Ms. DeCoco delivered a solid bite to a finger with one long tooth neatly bouncing off of the bone. Venus came to Metro Cat Rescue sick with a cold and had to be kept by herself so as not to infect the other kittens and cats. Missing her life of freedom and friends, the little girl often sobbed with tears falling from her eyes. Very wild, human friendship at first was rejected. After a trip to the vet, medicine, good food and warmth, Venus DeCoco became well. She has a kitten buddy. Venus DeCoco's days as a wild cat are oh so last year. 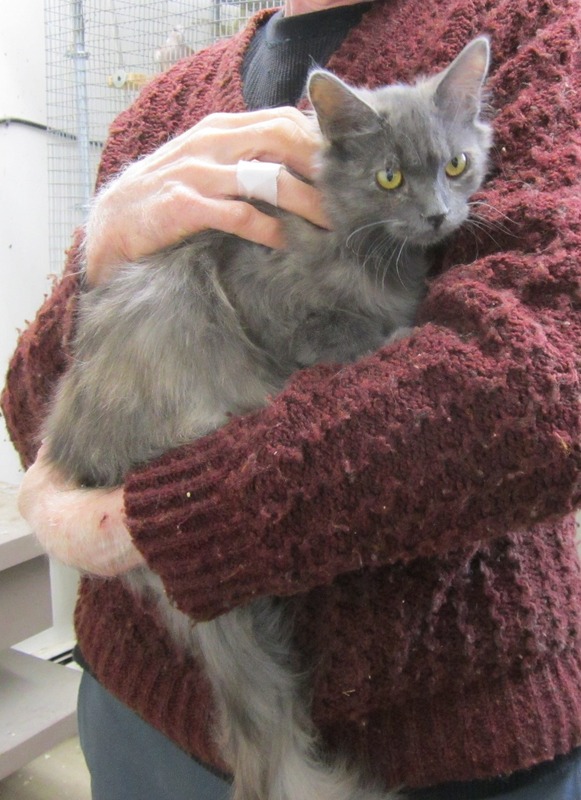 Beautiful Venus now loves people and is happy to be held all day. Anthony Olszewski and friends have been helping cats in need for for many years. We recently began operating under the name Metro Cat Rescue and hope soon to establish a formal organization. All volunteer -- receiving neither grants nor tax payer dollars -- we depend on community support. Please do help Metro Cat Rescue! All too often I've had to spend my own grocery money to make sure that the cats were well fed. If Metro Cat Rescue had better facilities and a used SUV or van for transportation, there's so much more that we could do. It's quick and convenient to use the DONATE button. If everyone reading this gave something, we'd be well on the way to providing for suffering cats who have to fend for themselves. THANK YOU! 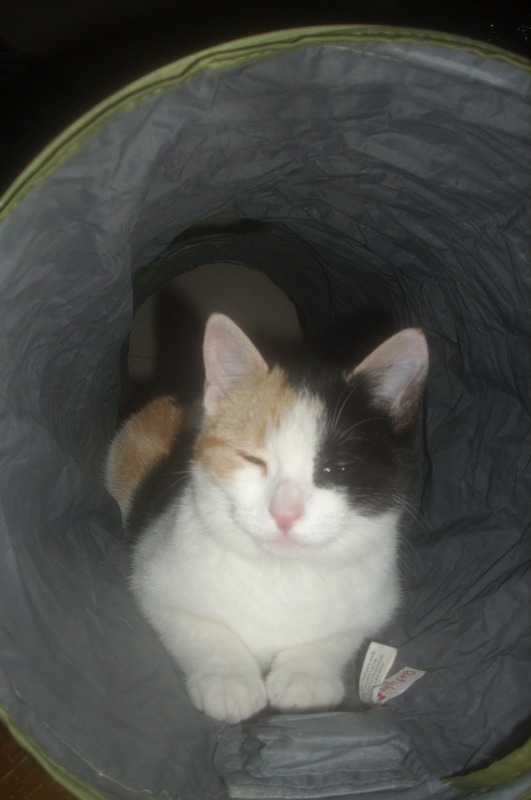 Little Calina loves to play in her kitty hideaway. This girl and many other cats need to be neutered RIGHT AWAY! Please donate so that Metro Cat Rescue can get this done. Metro Cat Rescue spent nearly $700 last month on neutering. This month, there was over $1000 in emergency vet bills. We have MANY more cats that need to be neutered and there's always the worry of sickness. PLEASE help! 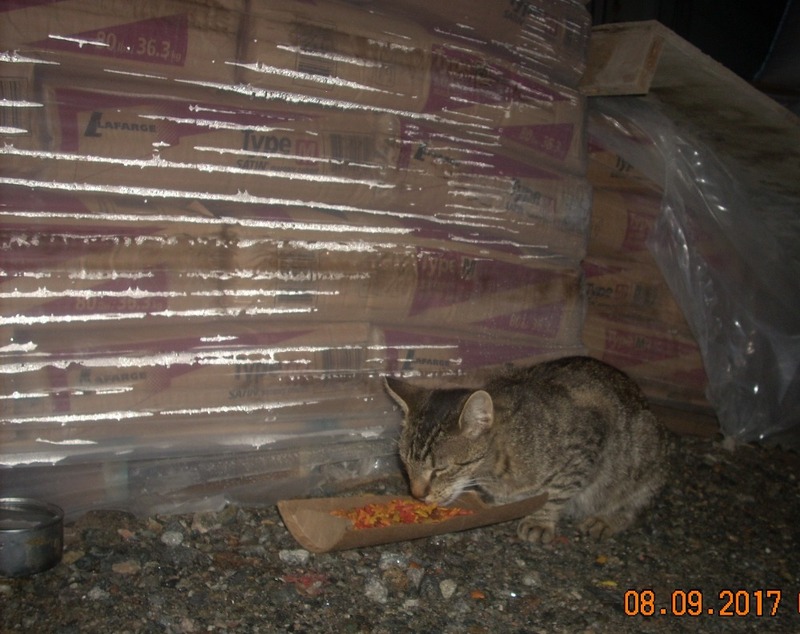 Metro Cat Rescue needs your help so that we can continue to help cats living in the streets. It’s quick and convenient to DONATE. Just click on the Donate button. If everyone reading this gave SOMETHING, we’d be well on the way to providing for suffering cats who have to fend for themselves. THANK YOU! It doesn't matter if it's cold and wet. 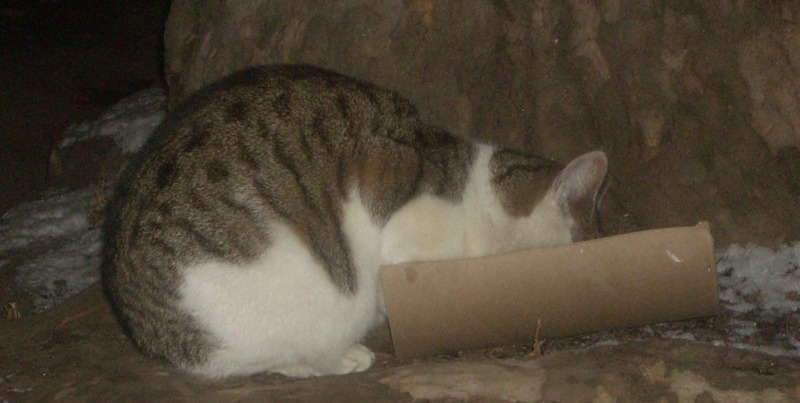 Each and every day, a Metro Cat Rescue volunteer feeds many colonies of community cats. And because of the shelters that have been installed, these neighborhood cats have a place where they can stay dry. Each and every freezing cold morning, a Metro Cat Rescue volunteer brings breakfast to this little lady and all the other cats living at a construction site. A Metro Cat Rescue​ volunteer had feeding stations and shelters set up in the backyard of an empty house. The building was demolished and a new home is being built at the site. The cats continue to arrive looking for breakfast at what was their home. Food now is provided especially early, well before the day's work begins. The food "bowl" is a section of an oatmeal container. The area is cleaned up and everything removed when the cats are done eating. These wonderful kitties need to be cared for!